Wayne Thiebaud is a Professor Emeritus at UC Davis, having been an Associate Professor at the University between 1960 and 1991. He apprenticed at the Walt Disney Studios while he was in High School , served in WWII, was awarded the National Medal of Arts in 1994, and is now 97 years old. I am not an expert on painting (other than houses, I was a fourth generation painter for a while) but I have always appreciated painting and wanted to be better at it. As a child my mother taught me how to paint with water colors which I am sure helped established my appreciation for all painting and art in general. I think I pursued Photography because my drawings and paintings were never accurate enough for my liking. I have always loved the works of Maynard Dixon and Ed Mel as well as other realist painters. Probably part out of jealousy for their talent. I like other styles and media too, but modern realistic works are my favorite, probably just because that is how I see. I have spent a fair amount of time in Davis the past five to six years. Hockey tournaments in nearby Vacaville with my son, helping a good friend successfully run for mayor there, visiting my daughter who is now entering her senior year at UC Davis, watching Aggie football (my daughter's boyfriend of 6 years is a starting Guard), and of course visiting with all their friends (buying meals and letting them laugh at what say). When my daughter was a freshman I checked to see what the school's art museum was like and found they were building a brand new facility. Turned out it was located within walking distance of my usual hotel and on the road I take every time. So for several years I watched the build with anticipation. The Jan Shrem & Maria Manetti Shrem Museum of Art at UC Davis opened in November 2016 and it is stunning, just a fantastic space. The architects who designed the museum have designed many impressive projects including Seattle's and Newport Beach's City Halls as well as Adobe's and Pixar's headquarters. I was finally able to visit The Shrem earlier this year when they were featuring the work of Wayne Thiebaud. I must confess I was not familiar Thiebaud's work before I walked in to the Shrem this year, but I am a fan now. 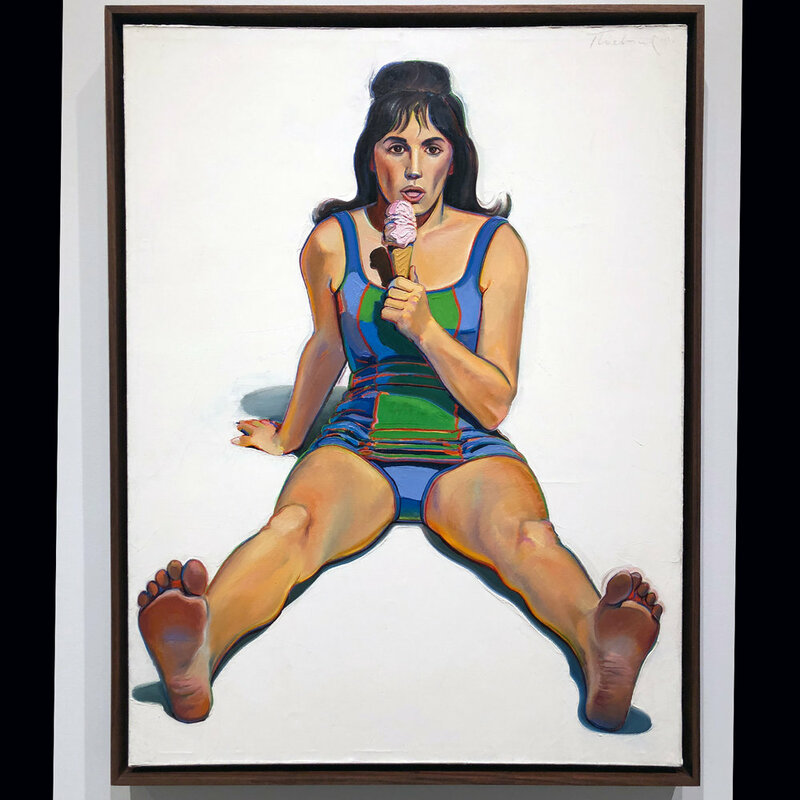 I am going to keep my review of Thiebaud's work relatively brief, and focus on my own response to to his work, because there are other people with better expertise than me to speak of Thiebaud's work and his career. 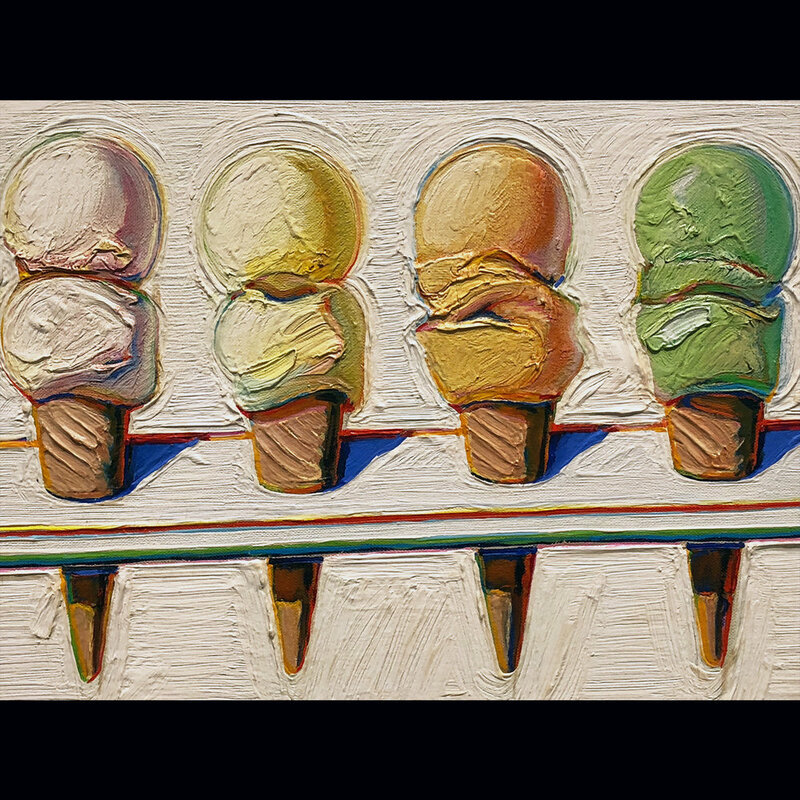 I absolutely love the texture, the layers, and the detailed combination of color in Thiebaud's oil paintings. They took me right back to my days at Arizona State when I took a color theory class, just appreciating how Thiebaud combined colors and highlighted edges with certain colors to such dynamic images. I always enjoy viewing painting at multiple distances, to see the general image while back and then how it was crafted when getting right up on the work. Every time I go to museums with my kids I probably annoy them some with how much I am in to how the different paintings are crafted, I just find it fascinating. The accompanying catalog published by the Shrem Museum and The University of California Press is outstanding. Shrem Museum's Founding Director Rachel Teagle did a very good job with this publication which chronicles a ten year period of Thiebaud's work in depth. There is insight in to the paintings and artwork but there is also great insight in to the painter's process and his life. One of my favorite parts was the reprinting of Thiebaud's July 1962 Artist Statement he submitted to The Museum of Modern Art. As someone who has his own artist statements I enjoy reading and comparing my statements to other people's statements, especially those who produce work different from mine. My favorite part of the “Welcome?” exhibit was the signs out front, made for a fun background. One room was full of these space blankets, they represented the needs of refugees, and it absolutely worked. It was fun watching people move through the room trying not to disturb them when the whole idea was to interact and take one with you when you leave (I assume the awkwardness of interaction was a key element of the piece). This space worked, I definitely appreciated it. This image shows how versatile the design of the gallery space, perfect space for video. Not a fan of this wall. Adults trying to replicate kids’ artwork I guess? Too literal for my tastes and if I am going to hear this narrative one more time give me something new or be creative with it. The Museum Space is fantastic. The spacious design allows curators to host pretty much any type of exhibition they want, there was obviously good foresight the designers. Walking through the galleries I kept thinking how great would it be to have an exhibition of my photographs in a space like this. "Welcome?" was the concurrent exhibition which was up when I visited. It was curated by Susette Min who is an Associate Professor of Asian American Studies at UC Davis. I found the subject matter of immigration to be very relevant but I was not impressed by most the work or the presentation (although I did like the concept of the room with packets of space blankets which patrons were encouraged to interact with and the signage out front). I'll end this post with this photo which is just an epic image.